PE Creative client UnionLine provide specialist claims services for union members across the UK. Being nationally recognised the company requires a logo style which reflects both professionalism and trustworthiness. The new brand utilises the UL element of the name as a clever device that is also be used as a social media icon and as a general graphic device. The team spent a lot of time developing the exact font style, line weights and proportions of the various elements in order to create a clean, professional and fit-for-purpose brand identity. The logo development is now being rolled out across newly published literature, stationery, exhibition panels as well as on-line collateral. UnionLine said "We are really pleased with the new look and believe that this will help us to continue to take our organsiation successfully into the 21st century, Jonny and his team have done a really professional job, on budget and on time"
Jonny Evans commented "it's always exciting to work with an existing brand along with its loyalties and customer expectations and to be able to successfully help them improve and expand their reach. Both in terms of brand identity and visual appeal we are delighted that the new identity has been so well received". One of the key remits was to ensure that Scottish law be included across the identity. 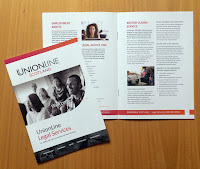 To this end we developed UnionLine Scotland with the same amount of care and attention. Subtlety along with a quiet confidence underpins both brands, whilst retaining a strong link between the two markets.